Desert Vista displays the title plaque from two days of toil in winning the annual Brophy Invitational Volleyball Tournament. The Thunder edged Mtn. View in three sets for the triumph. (Azpreps365 photo). 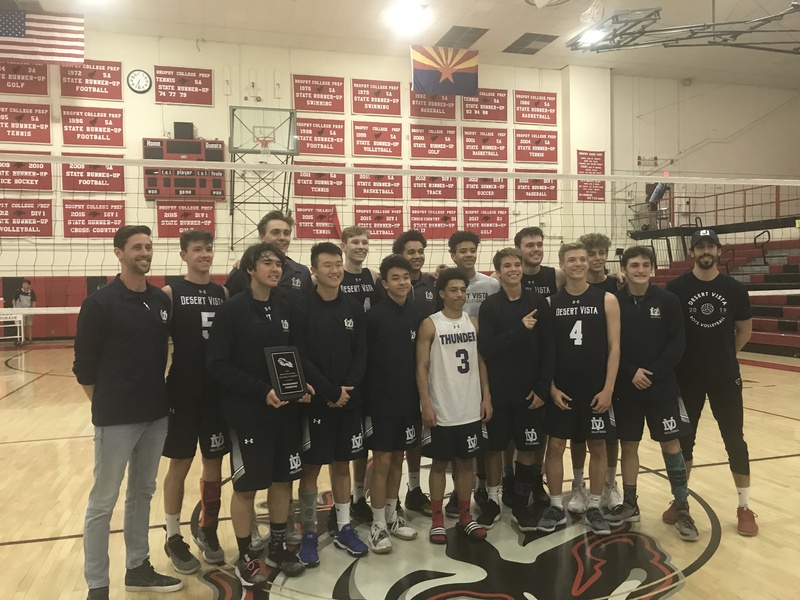 Desert Vista had to win the hard way Saturday in capturing the 20th annual Brophy Invitational Volleyball Tournament. In the end perhaps it was more satisfying. The Thunder put to rest frustration at having not beaten Mesa Mountain View in big matches earlier by playing at a high level in a come-from-behind 2-1 victory over the Toros at Brophy Prep. Scores of the final were 19-25, 25-20 and 15-12. A month ago Desert Vista finished runner-up to Mountain View at Chandler High's Wolf Howl Invite. As bracket play dawned Saturday Desert Vista was essentially the top seed and plowed through its first two matches with two-set triumphs over Sandra Day O'Connor and Perry. Next loomed Mountain View, who won a three-set match from the Thunder iand sent them to the loser's bracket in the double-elimination format. The win earned Mountain View time off while Desert Vista played another match - a tough three-set win over Highland -- to get another shot at the Toros. Desert Vista coach Scott Lucas watched his team lose the opening set in the final to Mountain View and urged them to concentrate on doing what they do best. The Thunder responded with great all-around play to win the tourney title for the first time in school history. They were runner-up last year on the way to winning the 6A title. "We weren't able to get to 20 points in the championship matches we played with them until the second set today" Lucas said. 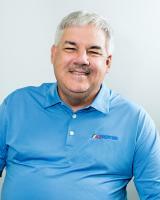 "Mountain View was playing well, but we weren't helping ourselves with a lot of unforced errors. "We put it together the last two sets. We knew where the matchups were, and made the right passes. Our setter Jaiden Huynh was the player of the match in my opinion. He stepped up. It became who was going to be next on the attack. I felt like we earned this." The tournament's outstanding player, Desert Vista outside hitter Landon Fuller, led the Thunder unofficially with 13 kills. Middle Mason Harbertson added six. Five different players chimed in with kills in the second set and Desert Vista's blocking went to a higher level to score points in the final set. "Who knows, maybe we'll see them again in another championship game," Mountain View coach Kevin Powell said, referring to the state title the middle of next month. "There aren't many matches where our opponent out-passes us. They did in this one." Mountain View's attack leaders unofficially were outside hitter McKay Anderson with nine, middle Karson Sherwood (7) and Preston Jones (5). Desert Vista and Mountain View dominated the all-tournament team from the 12-team field. Joining MOP Fuller from Desert Vista were right side hitter Dapre Rogers and Harbertson. Mountain View also placed three -- libero Brigham Goodman, Sherwood and Jones. 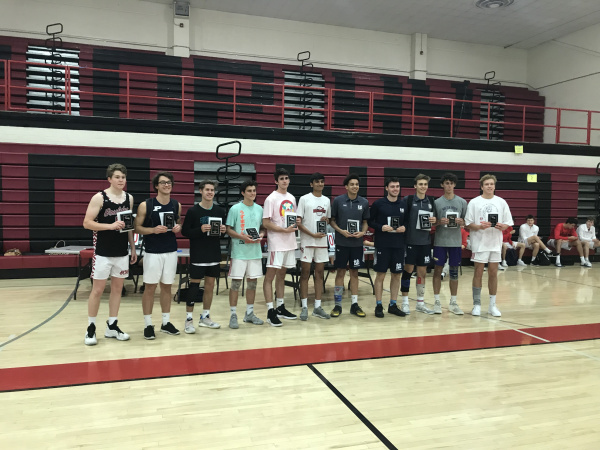 Rounding out the members -- Highland libero Koa Grover, Perry setter Daxton Tolman, Brophy middle Rohan Sidhu, Boulder Creek outside hitter Jackson Hickman, Mesa outside hitter Brigham Spilsbury and Millennium setter Nathan Avitia.